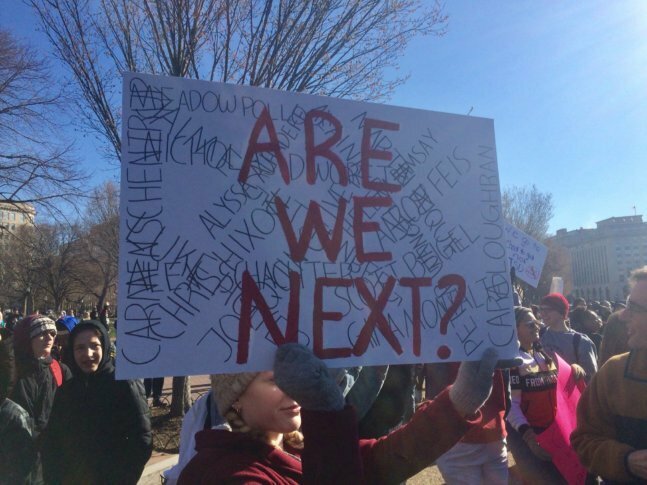 WASHINGTON — With a combination of silence and chanting, students left area schools to participate in the National School Walkout to protest gun violence. Hundreds of students gathered in Lafayette Park, across from the White House, at 10 a.m. for 17 minutes of silence — one minute for each person killed in the Florida school shooting last month. “We’re tired of seeing children die,” one protester told WTOP. At about 11:15, a group of lawmakers descended the steps of the Capitol to address the marchers. U.S. Sen. Tim Kaine said the students comprised “the new ingredient” that was “changing the terms of the debate.” He drew parallels to Martin Luther King’s work desegregating public accommodations, in which the involvement of teenagers – which King resisted at first – tipped the scales. “In the past, it seemed despairing – that after a shooting there’s a little bit of talk, and then nothing happens,” Kaine said. Among the changes he suggested were universal background checks and reauthorizing the Centers for Disease Control and Prevention to study gun violence as a health issue. But the kids had the most to say. 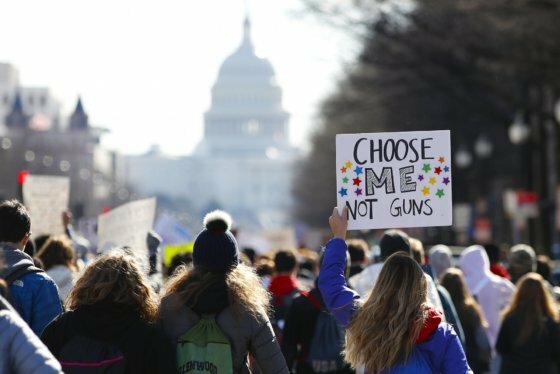 Eri Shay, a freshman at Quince Orchard High School, said she had once lived in Japan, where people are allowed to own guns – after taking a class, a shooting test, a mental health test, a drug test and a background check. “There has never been a mass shooting in Japan – ever,” she said. More than 28 D.C.-area schools participated; more than 3,000 school districts nationwide are taking part, ABC News reported. Standing in front of the wind-whipped Capitol, D.C. police Chief Peter Newsham said students had exercised their First Amendment rights peacefully. “They seemed very energetic and passionate about their issue, but they were very cooperative with law enforcement,” he said. Police coordinated with area schools ahead of the planned walkout, Newsham said. Many D.C. high schools held their own rallies in remembrance of the 17 people killed in Florida last month. WTOP’s Nick Iannelli, Dave McConnell and Megan Cloherty contributed to this report.